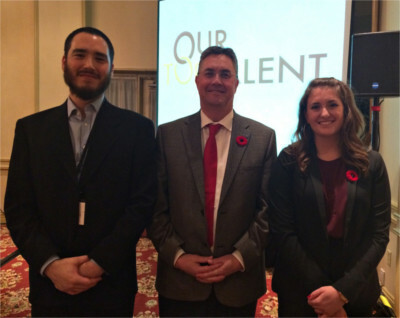 The Wallace McCain Institute (WMI) at the University of New Brunswick named its most hirable graduates at its Our Top Talent (OTT) competition in Fredericton last week. Now in its third year, the competition gives top graduating students the opportunity to pitch themselves to New Brunswick-based employers in exchange for business cards. Sara Taaffe and Peter McGaw were named most hirable recent grads after delivering the best pitches to 100 of New Brunswick’s top employers. “The two minute pitch is intense and places pressure on students, because they are pitching themselves for 100 jobs in two minutes,” says program founder and WMI Youth Initiatives Manager, Jenelle Sobey. The business card represents an opportunity, a chance to have a coffee, access the employers network, an internship or employment. “The initiative was developed to address students’ perception that there are no opportunities in New Brunswick and showcase to employers that new graduates might not have the three to five years work experience, but they have talent and potential,” says Sobey. Winner Sara Taaffe says she learned about the possibilities available to her in New Brunswic. “At OTT, I learned that there are many individuals who are investing in the future of New Brunswick, and that not all ‘good’ jobs are out west,” says Sara Taaffe. Taaffe, originally from Alberta, is a graduating from Renaissance College at the University of New Brunswick with a bachelor of philosophy in interdisciplinary leadership studies and a minor in entrepreneurship. Peter McGaw was the second OTT competition winner. “There are great rewards in taking risks and stepping outside of my comfort level,” says McGaw. “OTT gave me the confidence that I will require as I take the first steps into my new career.” McGaw will graduate from UNB with a bachelor of science in electrical engineering. Employers in the room included the New Brunswick Business Council, a CEO member base of some of the most successful companies in N.B., and alumni of the Wallace McCain Institute, which is made up of small and medium size growth stage companies.